hile this is not an exhaustive account of the caliber of chess played by Black masters, it provides a glimpse of the contributions each has made to the beauty of the game. The following games are not placed in any particular order, but the games will appeal differently to the tastes of the viewers. Perhaps all of them show the toughness of the players and the elements which have made all of them Masters at their craft. For the first time, these games have been assembled in a compendium for the world to enjoy. 1. FM Emory Tate-FM Maurice Ashley, New York 1993, ½-½. Referred to in (now GM) Ashley's "The End of the Draw Offer" essay, this game is the benchmark for fighting chess. The ferocious tactician Emory Tate throws blow after blow, but Ashley weathered the storm and threw a few blows of his own. Just when it looked as if Tate would succumb to Ashley's superb endgame play, he pulled off a magical combination which resulted in a humorous ending. Truly a classic battle and a perfect example of fighting chess from beginning to end! See game; Tate profile … Ashley profile. 2. IM Amon Simutowe-IM Robert Gwaze, African Zonal 2000, 1-0. At the time of this game, the young Zambian teenager was taking the African continent by storm by winning every tournament in sight. He then set his sights on the international community with a number of strong results culminating in a silver medal performance in the 2000 Chess Olympiad and a 2600 performance rating. Peaking at 2470, the "Zambezi Shark" has received praise from strong players around the world including none other than GM Garry Kasparov, who described Simutowe as a "bright talent." The featured game was against another bright talent in Zimbabwe's IM Robert Gwaze, the two-time African Junior Champion who would later win a gold medal in the 2002 Olympiad. See game; Simutowe profile … Gwaze profile. 3. 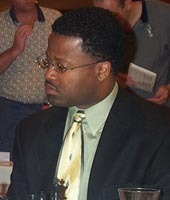 FM Emory Tate-GM Leonid Yudasin, U.S. Masters 1997, 1-0. This game found its way into the pages of the July 1997 issue of Chess Life… annotated by IM Jack Peters. At the time, this game caused quite a buzz in chess circles and gave testament to Tate's incredible attacking skill which was already widely-known. Surging forward with 11.Bd5!? and later 19.Nf5! perhaps Yudasin knew it would be a fight to the end. It WAS a fight to the end… his end. Tate pounced on Yudasin with incredible force throwing piece after piece in the direction of the black king. Yudasin defended desperately but eventually had to donate his Queen to avert resignation. However, 27.g6! (diagram) was too strong and Yudasin's forces were routed. See game; Tate profile. Having sacrificed two pieces, Tate continues with 27.g6! 4. FM Morris Giles-GM Walter Browne, U.S. Open 1988, 1-0. When the quiet and unassuming Chicago native sat down against the highly-touted American champion, he had only one thing on his mind… devastation. FM Morris Giles is not an imposing figure at the board and has a gentle demeanor, but his style of play resembles a hungry lion on the prowl. This game also made America's national magazine, Chess Life. In this game, Giles played very aggressively against Browne's pet Najdorf and dealt the first blow 12.Nxe6!? followed by a barrage of cannon shots toward the black King. Browne tried desperately to defend, but was hit by a beautiful mating combination to finish the game. Stunning! See game; Giles profile. 5. NM Wilbert Paige-IM Edward Formanek, World Open 1993, 1-0. The late Wilbert Paige (pictured left) had a very humble demeanor, but garnered the nickname of "evil" from his high school team mates… this game may show why. 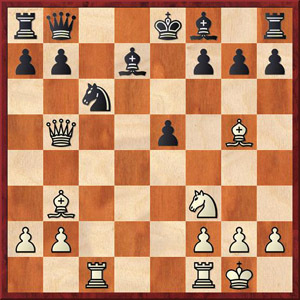 Wilbert faced Ed Formanek's characteristic French Defense and after 17.g4!? the game exploded. Both sides raced to the kingside to seize open lines. It appeared that Formanek won the race and appeared to have the edge before Paige uncorked a Queen sacrifice with 37.Qxe4!! The ensuing combination demonstrated how helpless black's position was against the pending invasion of the Rooks and game ended with an elegant mating combination. A memorial tournament would later be held in his name years after his untimely death in 1994. The tournament would feature ten of the top Black players in the world. See game; Paige profile. 6. GM John Fedorowicz-IM Watu Kobese, 3rd Mechanics Invitational 1998, 0-1. At the time of this game, Watu Kobese was the brightest star of Africa. Having studied 3½ years in Germany with the legendary Ludek Pachman and GMs Miroslav Filip and Lothar Vogt, the South African was beginning to make strides on the international scene. He had represented the continent in the World Championship cycle and was developing a reputation as a tough and relentless fighter. In this game, he totally outclasses the famous American Grand Master "Big John" Fedorowicz with the black pieces. White's position was reduced to passivity with Kobese's two bishops zinging the board. The African Lion pounced and ended the game neatly with a nice tactical motif. See game; Kobese profile. 7. FM Philip Corbin-Peter Chubinsky, World Open, 1985, 1-0. Perhaps one of the most beautiful attacking games ever played. Dr. Philip Corbin of Barbados has a reputation for wild, swashbuckling tactics and this game proves as much. This game was played at the 1985 World Open after which it was featured in the October 1985 issue of Chess Life magazine and would immortalize the man already known by many as "The Caribbean Tal." Corbin's 17.Rxc6!! is a move that only a true attacking player would find and the way the attack unfolds is instructive. It is certainly a game that even Tal himself would have been proud to play! 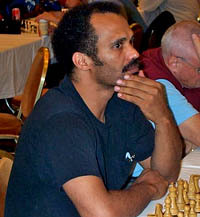 See game; Corbin profile (Barbados Chess Federation). Would you have seen 17.Rxc6!! in this position?? 8. M. Larreo Soto - Rogelio Ortega, Havana 1952, 0-1. 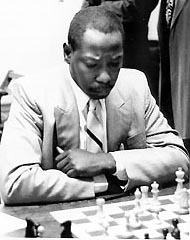 An obscure hero in the annals of Black chess history is Cuba's Rogelio Ortega. This maestro had played many of the world's best players including Tal, Spassky, Smyslov, Geller, Portisch, Reshevsky, Najdorf, Rossolimo, Bronstein, and Horowitz. He actually defeated Wolfgang Uhlmann and famous Russian trainer, Seymon Furman. In this exciting game (during the 1952 Cuban Championship), Ortega employs the Dutch Defense and the battle switched sides of the board throughout. Ortega sacrificed a queenside pawn to make use of his light-squared bishop, but it would be the dark-squared bishop that would deliver the crushing blow, thus rendering a geometric mating pattern. See game; Ortega profile. 9. FM William Morrison-FM Stephen Muhammad, St. John International 2001, ½-½. This game was played between two gladiators and demonstrated the ebb and flows of chess battles. Starting out as a quiet Vienna Game, the battle picked up steam as Morrison tried to overrun Muhammad's position with a kingside crush. Muhammad held and the game switched to an double rook ending… always beset of pitfalls and traps. 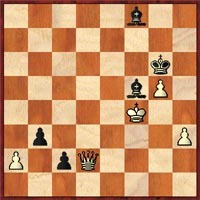 Morrison sacked a pawn in order to advance his pawn which rested two squares from queening. However, Muhammad broke loose and now his pawns were marching up the board! The game ended in a peculiar ending and finally both sides agreed to a draw. See game; Morrison profile … Muhammad profile. 10. Marvin Dandridge-FM James Rizzitano, Pan-Am Intercollegiate 1980, 1-0. Marvin Dandridge was only a Candidate Master when this game was played, but was clearly much stronger. His tactical vision is definitely on par with Emory Tate's, but he was never theoretically-prepared in the openings. Working on his Master's Degree at Chicago State University, he represented the school at the Pan-Am Intercollegiate tournament held in Atlanta, Georgia. This game attracted a huge crowd during its final stage and was featured in the June 1981 issue of Chess Life. Dandridge was facing Boston College's star James "The Whiz" Rizzitano. While he was heavily outrated, Dandridge was allowed to display his attacking skills in full view of the participants. 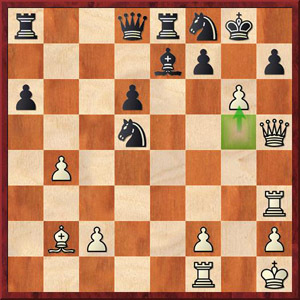 After 53…b3, how does Dandridge stop the pawns?? After an exciting middlegame, the ending featured Dandridge's Queen versus Rizzitano's two Bishops and passed pawn on the 7th rank. Rizzitano has just played 53…b3 threatening 54…Ba3 and 55…c1(Q). Marvin's just barely held the marauding queenside at bay. How did he do it? See game; Dandridge profile.